Which Apple Watch Series 4? 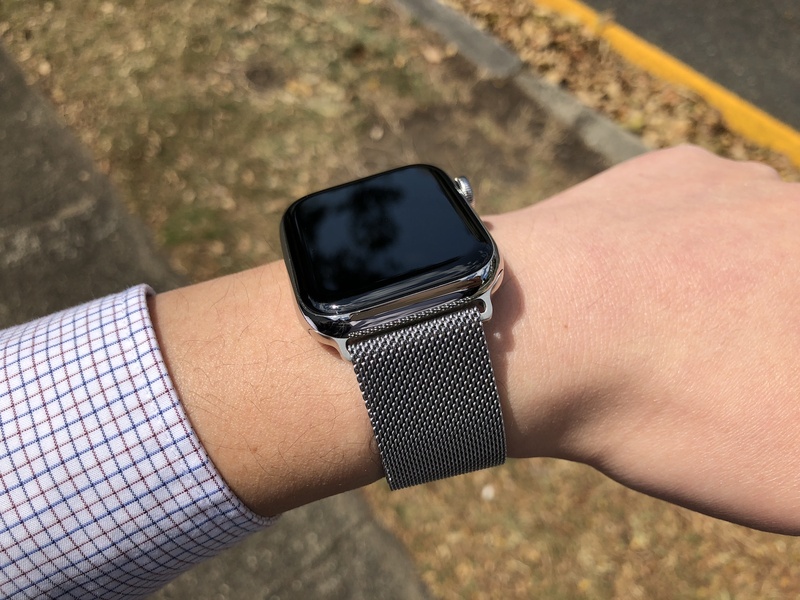 Stainless Steel Apple Watch Series 4 – but with a fake or real Milanese loop? I have one of those decision-making problems again. After pre-ordering the Apple Watch Series 4 in Stainless Steel as soon as it became available, getting it on release day, and marvelling at just how much better it was in literally every way (besides, maybe, telling the time) than my old Series 0, I returned it before my 14 days was up. All because I’m not sure if I want the regular Stainless Steel, or the Space Black Stainless Steel. As I said on Twitter, it’s not that I dislike the regular Stainless Steel. I’ve worn a Stainless Steel Series 0 since day one of the Apple Watch, so I’d like to think I know what it does well. It has plenty of advantages that the Space Black doesn’t, including a classic/timeless look, the fact that it probably combines better with more bands, wears better over time, and looks marginally better in various situations or when paired with different outfits. I mean, most classic watches you see come in silver. Putting aside the issue of watch/lug mismatch for a moment, there’s probably a reason why the Apple Watch Hermés only comes in the Stainless Steel, and even though you’ll eventually get scratches on your Stainless Steel, they’re not something a casual observer of your watch is likely to notice. If they do bother you up close and in the right light, you can either polish them out, or write them off to “character”, a sign that your watch is worn and loved. As much I loved everything about the Series 4 hardware, I wasn’t sure about the finish. To me, it was as if I had simply swapped my old Apple Watch for a newer model, one that looked basically identical to the one I had before. Don’t get me wrong, the Stainless Steel Series 4 looked extremely nice on my wrist, exactly like a premium watch should — especially when paired with something like the Milanese loop — but for whatever reason, I wasn’t enamoured with it like I feel like I should have been. Some of that can probably be attributed to it looking near-identical to the one I had before, meaning it didn’t have as much of that “new and shiny” effect associated with any new technology purchase, even through it was, literally and undoubtedly, new and shiny. I didn’t hate the regular Stainless Steel, but the problem is, I didn’t really love it, either. Enter, Space Black Stainless Steel.